The couple say that their Cracker Barrel co-workers are like a second family. Recently, the duo took the restaurant’s motto — “a home away from home” — to another level by returning to the chain restaurant to take wedding photos and celebrate with diners. After tying the knot in October on Halloween with a relatively conventional ceremony, the couple headed over to their workplace to “say hello to co-workers who couldn't attend the wedding” and document the happy day, according to wedding photographer Meg Umberger. 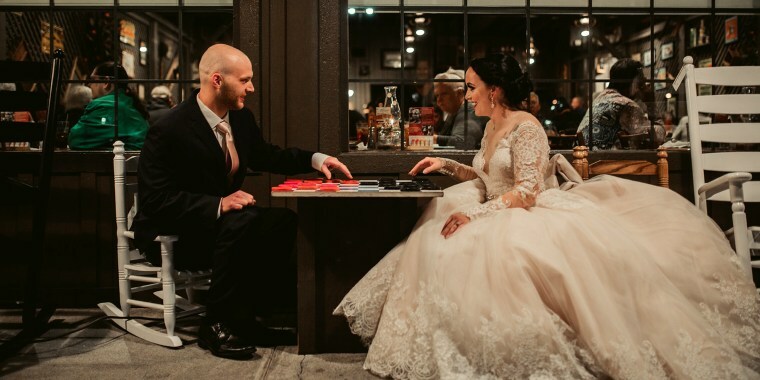 As true Cracker Barrel lovers, the newlyweds kept the restaurant open during the photo shoot and mingled with diners as they posed in their wedding attire. “I thought the guests would be upset about us being in there taking photos, but everyone seemed to really enjoy the spectacle,” Umberger told TODAY Food. The Nelsons still work at the same Cracker Barrel where they first met in 2014 on the bride’s first day. By January 2015, “the 24th to be exact,” according to Katrina, the pair were hopelessly in love. Travis proposed on Oct. 18, 2016. Initially, he had wanted to wait until Oct. 30, which is Katrina’s birthday, but his excitement got the best of him. Though it's been four months since the wedding, the sweet and savory love story garnered new attention this week after Cracker Barrel’s official Instagram account posted a photo of the adorable couple. “Our very own lovely waitress and chef have found love right in our home and we couldn’t be more excited to share the news with y’all!” the chain, with 645 stores in 44 states, captioned its post on Sunday. "I Love this so much!!! Congratulations to the happy couple!" posted one well wisher, while another posted about her own story, "I worked at Cracker Barrel for six years and met my husband there as well! He was a Prep cook!" The delayed attention has both surprised and touched the newlyweds. Back in December, Katrina shared the same photo to her own Instagram with the Cracker Barrel tagline #HomestyleHolidays.